The Yorkshire moors are often described as a desolate (think ‘wiley, windy’) place, and they hold a certain reputation in the literary imagination as a setting for gothic romance. The Brontë sisters grew up on the moorlands, and their Romantic literary outputs capture that dark, wild feeling of isolation, obsession and early feminist ideation over and over again. 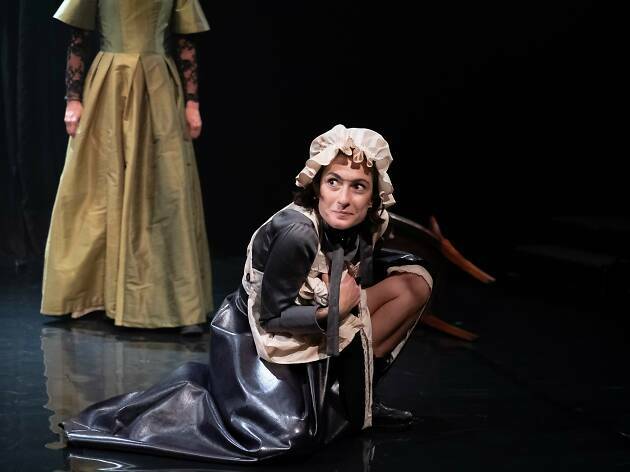 The Moors, a new play by American writer Jen Silverman, takes every trope in the Brontë handbook and queers it – collating their lonely estates and governesses and attic prisoners and shocking romances, and remixing them into an arch, surrealist play about love and anger and obsession. And also a talking dog. 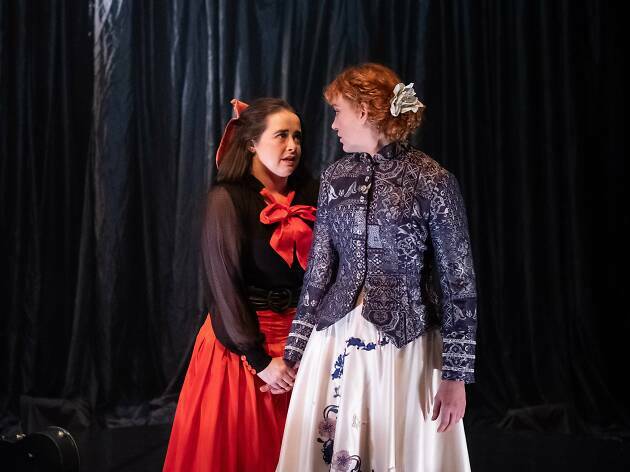 Emilie (Brielle Flynn) has been summoned to work as a governess in an isolated Moorland home, seduced by the hand of the head of the household, Bramwell. However, his sister Agatha (Romy Bartz), clearly in control of the home, won’t let her meet him. 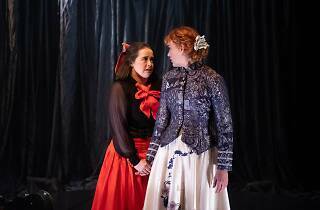 The other sister, Huldey (Enya Daley), dreams of fame and sadness, and confides in her diary. 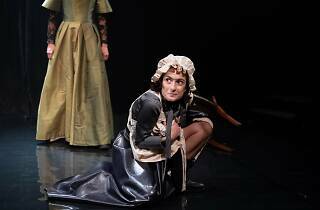 The maid seems to be the same person (Diana Popovska), and all the rooms seem to be same, and Emilie is told that life is different here, on the moors. 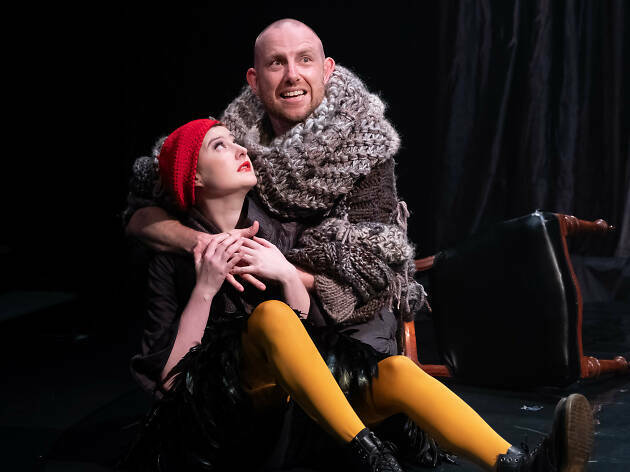 As she becomes consumed by the world of the sisters and their schemes, the family dog (Thomas Campbell) falls in love with an injured moorhen (Alex Francis). The script is lively and camp even when it comments on queer desire and unhealthy possession, female oppression and rage, and is written to be sharp and blackly comedic; it’s a pleasure to experience Silverman’s work. 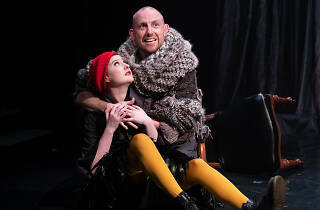 This production of The Moors, however, by independent group Siren Theatre Co and directed by Kate Gaul, doesn’t cut quite as cleanly or deeply as the script. It’s too loose and too broad to land with a satisfying rip; the production frequently feels at odds with the script. It’s more playful than cutting, more charming than precise, and while it’s still funny and easy to watch, there’s a sense that the work could be refined and elevated. You can’t get lost in these moors. Still, there are highlights: the cast are all enjoyable to watch, and Bartz’s delivery of Agatha’s most dismissive lines is a delight. The slow-revolve upon which the show’s single setpiece (a running gag of meta-theatricality often mentioned in the script – yes, the bedroom does just look like the parlour!) is built creates a wonderfully off-kilter, low-key foreboding. Even if the production feels gentler and less impactful than its underlying script, Gaul’s direction does feel unified, consistent and thoughtful. It’s a fun night, and there are plenty of laughs to be hard. But you may well feel like you’ve been left hanging; there’s a sense that we could have had more from The Moors than we ended up receiving. I loved it. Went with my boyfriend and we had a great night out. Such a fun play, need to see more theatre like this.